This Open Box product is available in limited quantities while supplies last. To see all of our available Open Box products and other deals, visit our Clearance CenterThe PWS-406P-1R power supply offers incredible space savings for embedded applications and is ideally suited for 1U short-depth ,industrial PC. In situations requiring high-availability such as mission critical and high-density server computing, it provides redundancy where space and thermal limitations present a challenge. 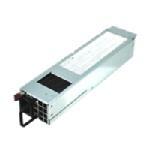 Like all Supermicro power supplies, the improved overall power efficiency significantly reduces energy consumption and TCO. The PWS-406P-1R power supply provides an excellent power factor and 93%+ efficiency, superior to 80PLUS Gold level performance. This minimizes infrastructural and Uninterruptable Power Supply (UPS) cost, and reduces total Volt-Ampere (VA) and Watt requirements.